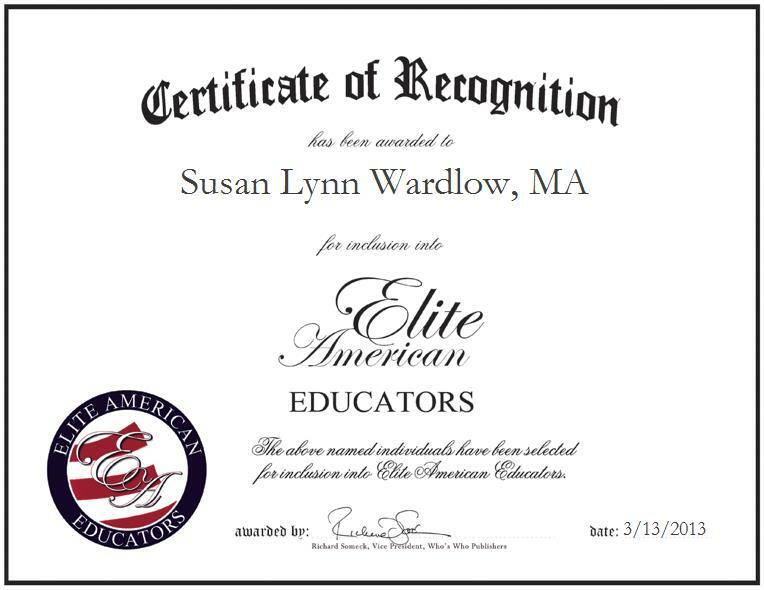 COARSEGOLD, CA, March 13, 2013, Susan Lynn Wardlow, MA, Teacher and Instructor in Fresno and Madero County, has been recognized by Elite American Educators for dedication, achievements, and leadership in child development and education. In her current capacity, Ms. Wardlow is in charge of tteaching preschool, kindergarten, elementary, and intermediate and adult students. She also supervises community college laboratory students majoring in child development, after-school elementary students, seniors, elders, veterans, and Alzheimers’ clients. Ever passionate about helping others to learn and grow, Ms. Wardlow supports worthy initiatives in addition to teaching for the county; she volunteers at a local community church, private school, and state community college child development center when she is not teaching. Chief Executive Officer, Golden Apple Elite Team, La Petite Academy, Inc. Through the years, Ms. Wardlow has found herself maintaining a genuine interest in working with and educating children as a volunteer. This innate fascination with assisting others in accomplishing their academic goals has allowed her to thrive professionally, and she has strived for excellence in her every endeavor. The highlight of her career was being affiliated with 15 pre-kindergarten and preschools: three in Colorado and 12 in California; this led to her receiving a Riverside County award to pursue education in child development and her NAEYC membership in 2002. Other highlights include being named Professional Educator of the Year by Cambridge Who’s Who in 2010 and Top Female Executive by Worldwide Who’s Who, honors that were based on these earlier experiences. Ms. Wardlow has provided educational services to five school districts in Madera County, Calif., Denver and Aurora Public Schools in Colorado, private schools in California and Colorado, and church schools in California and Colorado. In addition, she provided educational services to organizations, including tutoring businesses and the YMCA. She served as an at-risk program supervisor in Camp Pendleton in Oceanside, Calif., and will continue to support the founding and continuance of preschools in Colorado and California by volunteering her time.